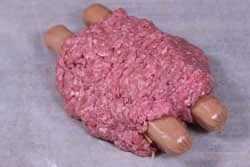 Why make folks choose between a hotdog or a hamburger! Give them the smoked burger dog and they'll all be happy. 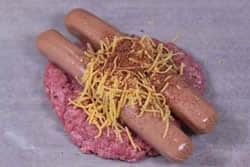 It's a half pound burger with two of your favorite hotdogs cooked into it. 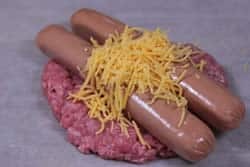 Add a little cheese in the center and you have a crowd pleaser that won't stop this Labor Day! I make these on the smoker with plenty of smoke but you could also grill them or even fry them if you were so inspired. 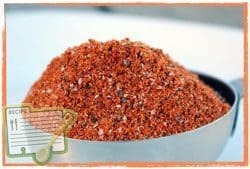 My rub is all you need to season up these smoked burger dogs and it will amaze all of your guests when you use it on ribs, brisket, pulled pork, or even chicken this Labor day. 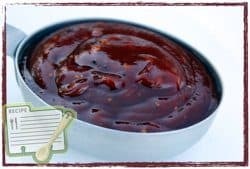 I promise you’ll love my dry rub/seasoning recipe and my barbecue sauce recipe or you don’t pay! Be sure to use 80/20 or even 75/25 ground chuck or ground round. 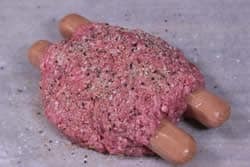 I do not recommend using hamburger or ground beef if you are after maximum flavor and juiciness. 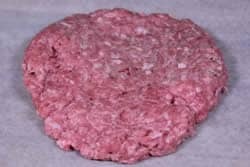 Separate the ground chuck into pieces that are about ¼ lb each and, without overworking the meat, make a ball out of one of those ¼ lb pieces. 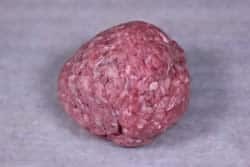 Lay the ball on a piece of wax paper and carefully form it into a patty that is about 4-5 inches in diameter. 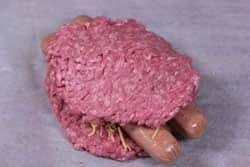 Lay 2 hotdogs on top of the burger patty with a little space between them. 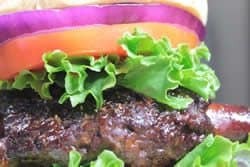 I have often used my original rub recipe (purchase recipes here) on top of burgers but this time, I decided to use the new Texas style rub (purchase recipes here) recipe on top. Place the burgers onto a Bradley rack, Weber grill pan or a cooling rack and you are ready to smoke 'em! If you want more smoked burger dogs, double, triple or even quadruple the recipe. 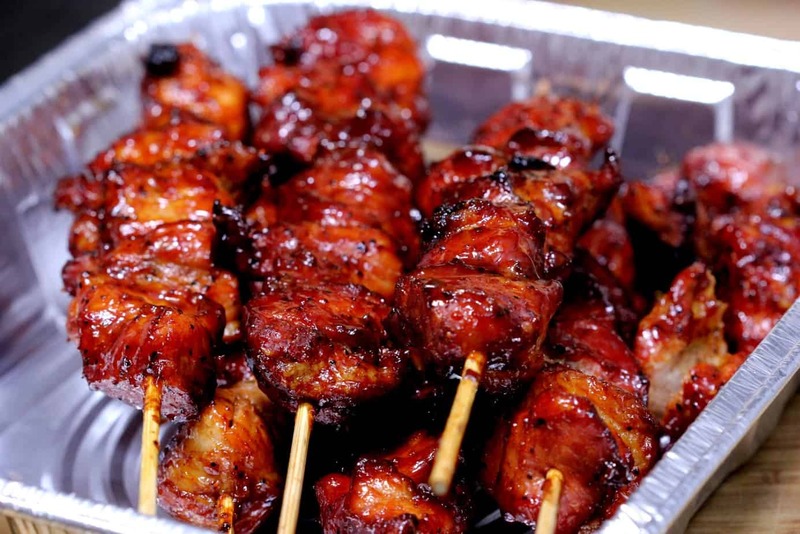 These work well in any smoker or even on the grill. Set up your smoker for cooking at about 225°F and be sure to have enough smoking wood to keep the smoke going for at least an hour but I recommend letting the smoke go the entire time. 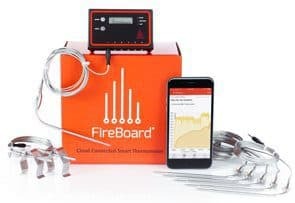 By the way, if you have a Big Green Egg or other ceramic cooker such as the Primo, be sure to get the FlameBoss Temperature Controller to go with it. 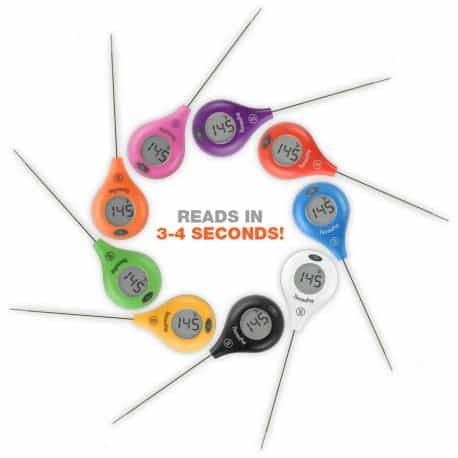 This is an important tool just like the plate setter and allows you to set up the cooker and walk away knowing that you can go do whatever you need to for hours on end without having to worry about the temperature of your smoker or your food. When the Flame Boss is on duty, you don't have to be! 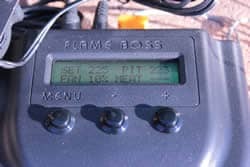 I use the Flame Boss every time I use the BGE XL And it is an absolute time saver for me! 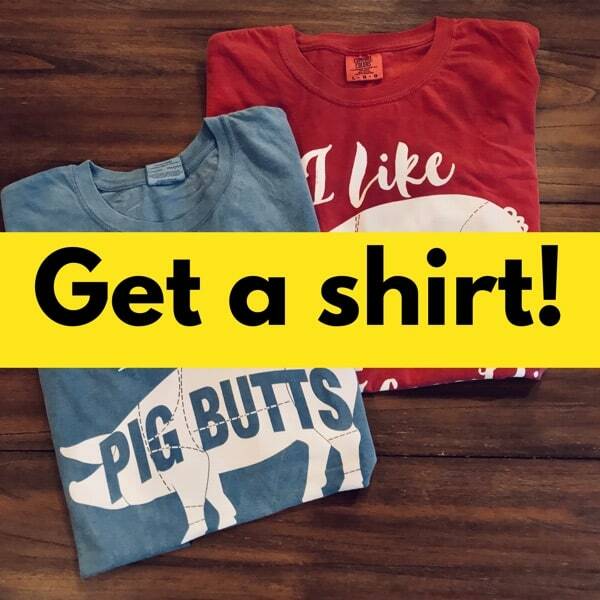 Click HERE to check it out further. 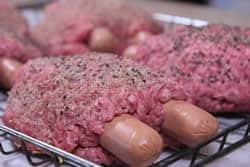 Place the burger dogs directly on the grate or if you used a Bradley rack, place the rack on the smoker grate. Let the burgers cook until they reach an internal temperature of 160°F . I used oak wood for smoke but you can use almost any smoking wood you have available. Some of my favorites are Pecan, mesquite, cherry and apple. 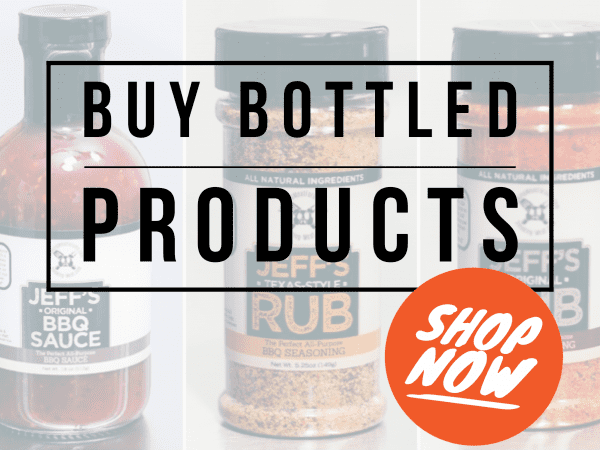 You can also use brats, polish sausage, etc. To make them more moist, form each of the burger patties around a pat of butter. Just in case some of you need a little help with your smoking, I have a list of the most common questions here with my answers. I recommend that you use a charcoal chimney starter if you have one. 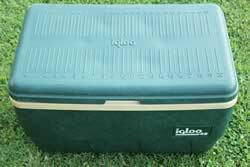 If not, you can pick one up at Lowes, Home Depot, Ace Hardware and even Walmart for around $15. You can also order them from Amazon.com. Tip 2: If you have a grill with a side burner you can omit the paper. Fill the chimney starter with charcoal and set it on the lit burner to get the charcoal started. Once the charcoal is burning good, you can turn the burner off. Briquettes are made from wood and several other additives and chemicals to help the pieces to hold their shape, burn better, etc. while lump charcoal is simply pieces of hardwood that have been pre-burned in a low oxygen environment. Briquettes burn more evenly, are less expensive and are easier to use for some due to their uniform shape and size. Lump is more expensive, burns hotter but is very non-uniform in size and shape making them sometimes more difficult to use especially in certain situations. I prefer lump for most of my cooking but I do use briquettes on occasion if I am needing a more consistent burn. 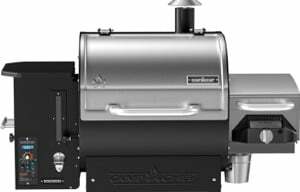 What is the Difference Between Gas, Electric, Charcoal And Wood Smokers? Smoking in it's most basic terms is simply a combination of heat + smoke. It really does not matter what you use as a fuel whether electricity, propane, lump charcoal or splits of wood, as long as you can maintain low temperature and provide smoke. When you have heat + smoke, the smoking process is happening. In wood smokers, this works slightly different in that the wood is the fuel as well as the source of smoke. 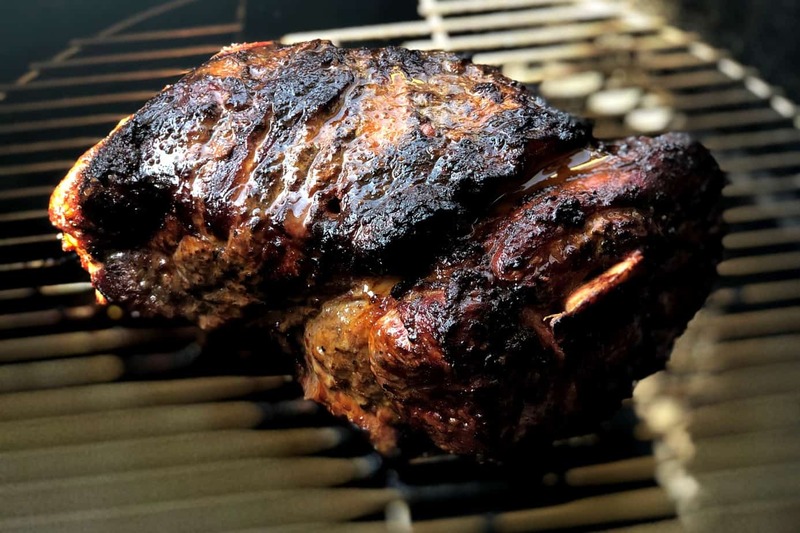 For this reason, wood smokers tend to produce the most flavorful smoked food. The meat is also usually more smoky tasting since the smoke is flowing from start to finish whereas in a gas, electric or charcoal smoker, you may choose to stop adding wood for smoke at a certain point. Use the internal temperature of the meat rather than time to tell you when the meat is done. For some reason, this confuses people. 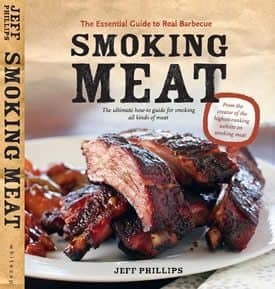 I get asked all the time if the smoking time is doubled when you double the amount of meat in the smoker. The answer is no in the same way that (2) cakes would not take twice as long to bake as (1) cake. The heat is working on both at the same time and they both get done in about the same amount of time. 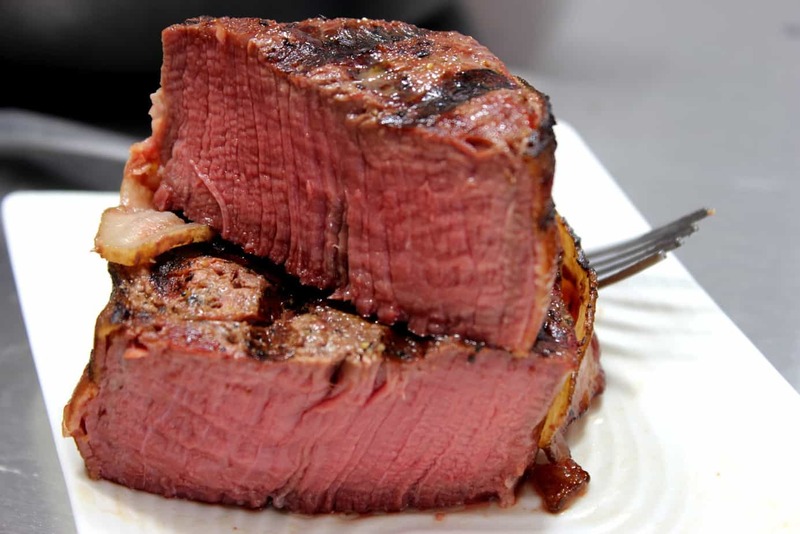 The amount of time that meat takes to reach it's finished stage is based on the geometry/size of the piece of meat. Many times we use formulas of x amount of hours per pound of meat but in actuality it is the thickness of the meat that is most relevant in determining how long it will take to get done. Unfortunately, unless you are going to break out the calipers and measure the thickness of the meat and do some pretty crazy math, this isn't going to be easy to figure. 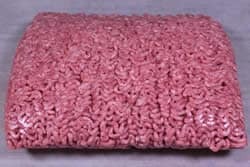 For this reason, we assume that the weight is usually proportional to the thickness and is relevant enough for estimating how long it will take to cook a certain weight of meat. 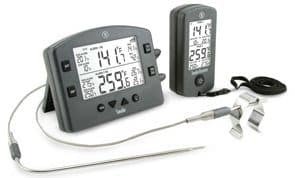 Regardless of how much time you estimate, you must use the internal temperature of the meat rather than time to determine when the meat is finished cooking. For example, we often estimate brisket and pork shoulders at 1.5 hours per pound. Using this formula, an 8 lb pork shoulder is estimated to require around 12 hours. It could, in fact, take only 10 hours or it could take 14-16 hours in rare circumstances but usually the formula gets us pretty close so it's a reasonable way to estimate the time. I like to figure the time using the method then add about 2 hours for padding. I can always keep the meat warm if it gets done early but there's nothing I can do to hold back the angry natives if dinner is 2 hours late. Simply wrap the meat in heavy duty foil then in a heavy bath towel and place it in an empty ice cooler. Fill in any remaining space with pillows, towels, blankets, etc. and close the lid tightly. The meat will usually stay well above 140 degrees for 3-4 hours using this method. 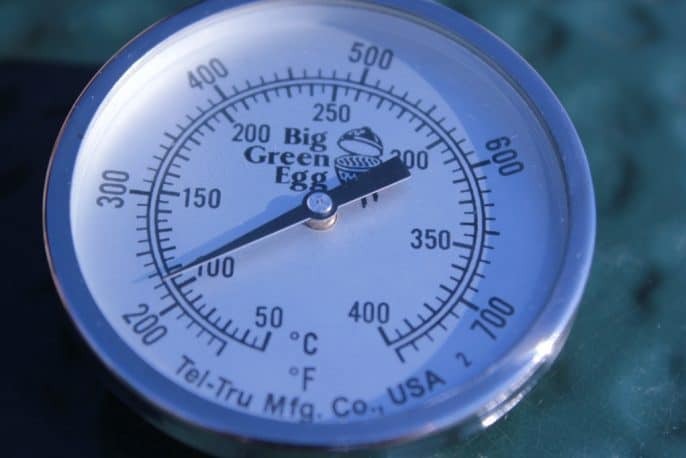 This is due to the low heat that is typical of smoking and the only methods that I have found that help to lessen this phenomenon is to either raise the temperature of the smoker to 275°F or more or to smoke the chicken as normal until it is about 80% done then finish it off on a very hot grill. I prefer to smoke cook the chicken at around 240°F to give the smoke plenty of time to flavor the meat then place the chicken on a very hot grill until it is finished cooking. For me, this yields the best results. 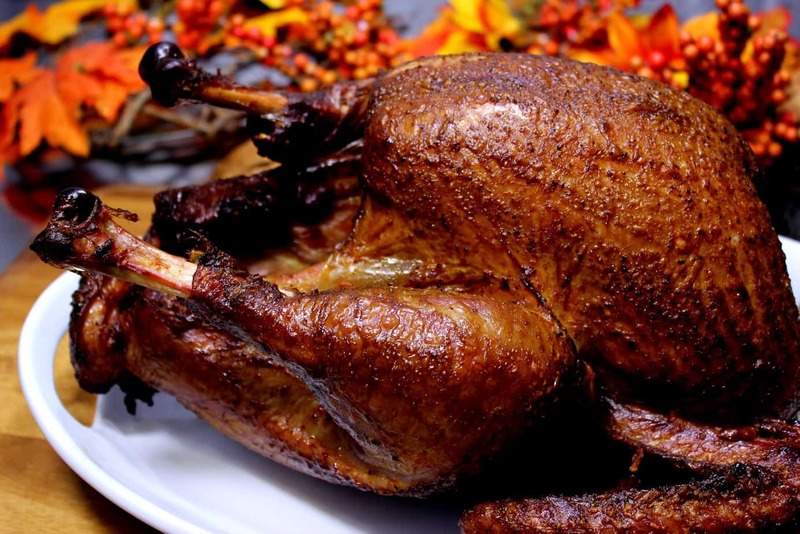 Having said that, the flavor of smoked chicken is unrivaled by any other method but I have not found a way to to get the same level of crispy skin using this method that you see on fried, baked or grilled chicken. Bark or No Bark (on your smoking wood)? If the bark is moldy, mildewed, rotten or bug infested then remove it. Otherwise, I have not found any taste difference between using wood with bark or without. For this reason, I don't worry about it unless I have to. Will Smoking Fish in My Smoker Make Everything Taste Fishy? I have not found this to be a problem as some have suggested. I regularly smoke fish in the same smoker that I use to cook many other types of meat and there is no distinguishable crossover of flavors. Many people soak their smoking chips and chunks before placing them in the smoker and while I am not sure where this got started, I have never understood the need to do this. I get my best smoke from dry chips wrapped in foil or in a metal box or dry chunks laid right on top of the charcoal or near the heat. It is my opinion that wet wood gives off steam until it begins to dry and then starts to produce some smoke. 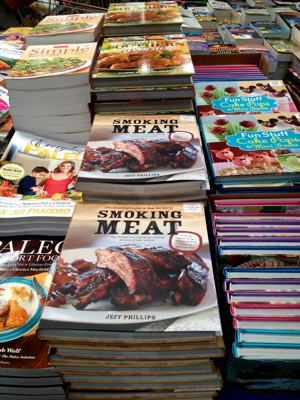 Why not just skip the soaking process and let it start smoking immediately? I have tried both ways and can only report what works best for me. If you soak your wood and find that it works well then there's no reason to stop but if you are just doing it because that's what you thought you were supposed to do, I recommend that you try it both ways to see what works best for you. 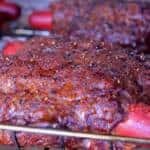 Many people report that the meat has too much smoke flavor and/or it has a bitter flavor. 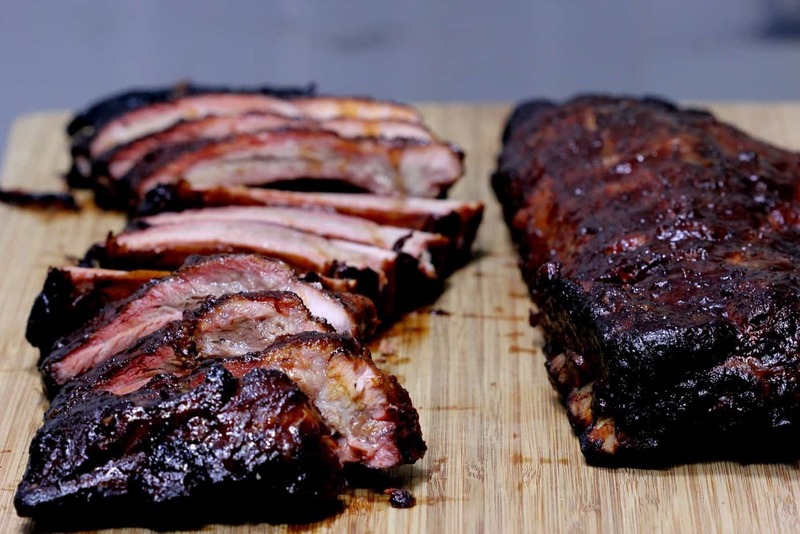 This is usually due to not having the correct amount of air flow into and out of the smoker. 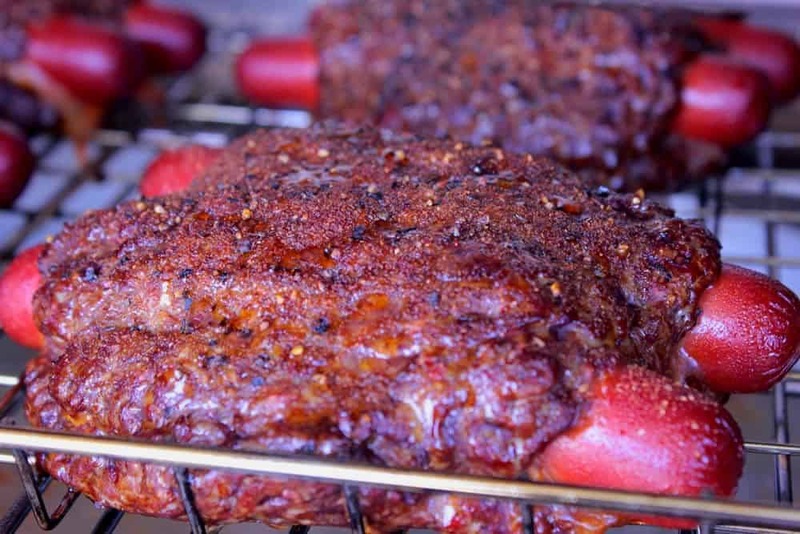 It is imperative for air to flow into the smoker and out of the smoker to create a draft. 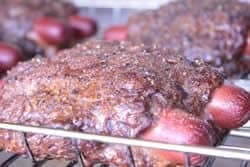 This draft is what pulls the smoke across the meat and out of the smoker so that is flavors the food correctly without making it taste like charcoal. Many of the more inexpensive smokers are designed to not seal very tight for this very reason i.e. the Brinkmann charcoal water smoker. If you look carefully there is at least a 1/4 inch gap all the way around the lid to ensure that the smoke can exit properly. This is most important with charcoal and wood smokers. Gas and electric smokers need to draft as well but this is usually accomplished with a lot less fuss in these types of smokers. If your smoker has vents at the firebox and/or at the top or far end of the smoke chamber, I recommend to never close them all the way while there is food in the smoker. Leave them open at least 25% to allow for proper airflow and I think you will find that the food will be perfectly smoke flavored. Smoke brats for no more than 2 hours at 225°F. Any more than this and they will get tough. Boudin does best at about 2.5 to 3 hours at 225°F. Place the burgers onto a Bradley rack and you are ready to smoke 'em! Set up your smoker for cooking at about 225 °F and be sure to have enough smoking wood to keep the smoke going for at least an hour but I recommend letting the smoke go the entire time. 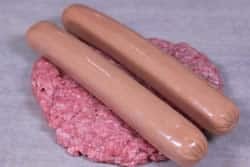 Put the burger dogs on a toasted bun heaped with lettuce, tomatoes, onions, bacon and your favorite condiments.